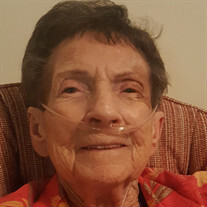 Harrison, Hildegard, Age 87, of Fairborn, passed away Sept. 19, 2017. She was born in Ubersee, Germany to the late Ferdinand and Anna (Huber) Fischer. 'Hildi' met the love of her life, George Harrison, while he was deployed in Germany during WWII. After she hit him with a snowball, their future together was fate. They married in 1951 and moved to America. Hildi loved her home and won many 'Mayor Beautification Awards' in Fairborn. Since 1951, she has been part of a group of about 25 other German ladies and their American husbands who all met while in Germany, married and came to the United States. Sadly, only a few of this "Greatest Generation" remain. Hildi also had many dear friends in the Wright-Patterson community and was loved by her neighbors. She was known to be straight forward, feisty with her words and frugal in her daily business transactions. She touched many lives and will be missed. In addition to her parents and siblings, Hildi was preceded in death by her husband, George, in 2003. She is survived by her son, Ken Harrison and his wife Letty Harrison. In keeping with Hildi's wishes, no public services are planned. Final resting place will be at Pinehill Cemetery in Shickshinny, PA. Arrangements entrusted to Morris Sons Funeral Home. In lieu of flowers, contributions in Hildi's honor may be made to any charity of donor's choice.